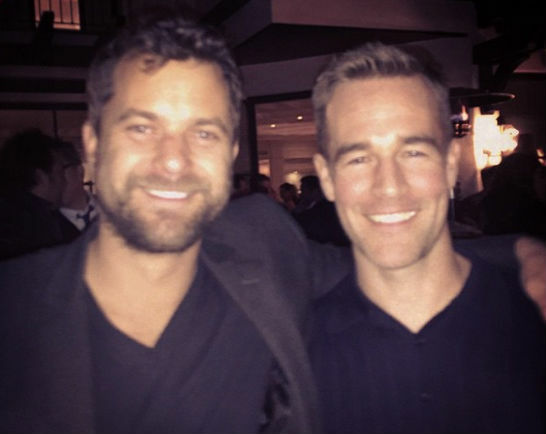 –James Van Der Beek ran into Joshua Jackson this weekend and posted the cutest, most squee-inducing photo of all time. -There was also a 10 Things I Hate About You cast reunion! –Solange Knowles’s wedding style is insanely great. Pants! A cape! A reception outfit that looks like a bathrobe! -Meanwhile, her wedding dance routine with her son to “No Flex Zone” is just the cutest! -On the other side of the glamour spectrum, Kourtney Kardashian had a baby shower at IHOP. -A new promo for Peter Pan Live! seems to indicate that Allison Williams will be attempting a British accent in it. Gulp. –Amanda Bynes and Paris Hilton reportedly fought in an LA nightclub. Did we just time-warp back to 2004? -Meanwhile, Amanda Bynes has released a statement apologizing for threatening to kill her parents. Uh, ok then? –Kim Kardashian might be buying a private island, which is exactly what I would do if I were rich. That, and hire a Mark Ruffalo lookalike to follow me around all day holding my purse. You know, normal stuff. –Liam Hemsworth is wearing me down. He got weirdly and hilariously cuddly with new SNL cast member Leslie Jones during this week’s closing moments, and on Friday he wore high heels on Fallon and talked about Jennifer Lawrence’s fish breath. -Aw poo. Evan Rachel Wood and Katherine Moennig have already gone their separate ways? But I barely got a chance to ‘ship them! -Here’s the trailer for Netflix’s new drama Marco Polo. –Chris Pratt, Steve Carell, Ansel Elgort, and Dave Chapelle landed on the covers of GQ’s Men of the Year issue. -Diplo’s feud with Taylor Swift and Lorde isn’t over yet because he’s clearly super mature and level-headed. -I’m not a huge fan of novelty songs, but Kristen Bell‘s “Text Me Merry Christmas” is pretty catchy. -The early reviews for Hunger Games: Mockingjay are in, and they’re overwhelmingly positive. The general consensus is that it’s really good — but really bleak. -Speaking of early reviews, the Australian premiere of Angelina Jolie’s Unbroken reportedly stunned audiences. It’s looking like two women might be nominated for Best Director this year. How cool would that be? -A short new trailer for Inherent Vice has landed. The buzz for this thing is already insane.